Baked Fish Rolls recipe by SumeraNawed at DesiRecipes.com. Pomphret fillets(sliced in half) 5 nos. Cabbage , shredded 1 no. Spring onions, chopped 3 nos. Lemon rind, grated 1 tbsp. Make a stiff dough using hot water and the ingredients for making the dough. Make 10 thin chapatis of this dough. Place one fillet on one chapati, the filling that you made and spread one teaspoon of cream on this. Now roll this chapati and seal the edges. Make the remaining fish rolls in the same way. Grease a tray and place the fish rolls in it. Pour the remaining cream over the fish rolls. 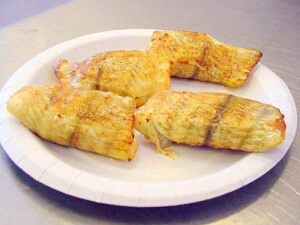 Bake the fish rolls in a moderately hot oven(300 degrees) for 15-20 minutes or until the top is brown. Sprinkle the cheese and bake till the cheese melts. You put the fish on the chapati and seal it....what do you do with the remaining filling? It doesn't say? How long do you bake and at what temperature.